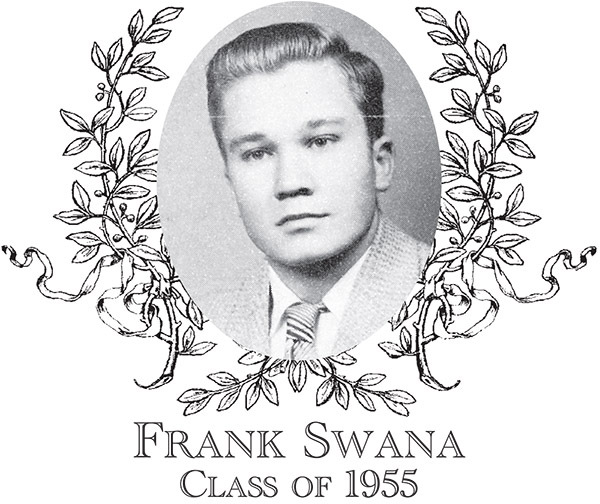 Frank "Frappy" Swana, Class of 1955, was a three-sport athlete lettering in football, basketball, and baseball for the Indians. In his senior year, Frank was Captain of the baseball team and was honored by the Exchange Club at their annual "Baseball Night" at the Webster-Dudley Golf Club receiving the Outstanding Player Award for the Bartlett team. He was credited by Hall of Fame Coach Sigmond "Ziggy" Strzelecki as one of the best leadoff hitters that he ever coached. Frank led the team in runs scored and stolen bases, having the distinction of never being thrown out in 43 base stealing attempts during his varsity career. He was also known for his versatile and spectacular infield play at third base, shortstop, and second base. On the gridiron, "fleet-footed Frappy" was a strong inside runner, however he was best known for his patented end-run sweeps. His speed was also readily apparent on the defensive side of the ball at the corner back position. Frank's hustle and intensity carried over from the gridiron to the basketball court. He was a defensive standout as a result of his speed and agility with an uncanny ability to move the ball up court and find the open man. Frank was recognized for his overall athletic career as the recipient of the most coveted honor of his time, the Herbert C. Branch Medallion, awarded annually to the most outstanding senior class athlete. Upon graduation, Frank served in the Massachusetts National Guard and remained very active playing semi-pro baseball and softball for various teams in the area. He was a lifetime member of the Elks and was the Exalted Ruler in 1986. Frank passed away in 2016, leaving his wife Joyce of 53 years who resides in Webster, their two children Anthony and Melissa, and two grandchildren.